In last week's installment, we showed you all the studios we visited during our long weekend in Boise. This week, we take you to the AM towers around the market. Boise itself sits at the eastern end of the Treasure Valley, which stretches more than 50 miles from Ontario, Oregon to the foothills that mark the eastern boundary of the city. Nearly all its AM stations, though, are located in a cluster of towers south and west of the city, and it's there that we'll spend most of this installment. Before we get down to the tower farm, though, let's show you three AM sites that sit in other parts of the Boise metro area. It's about four miles north from KNJY to KBGN (1060 Caldwell), another station that signed on around the same time, in this case with 10 kW non-directional, daytime only. 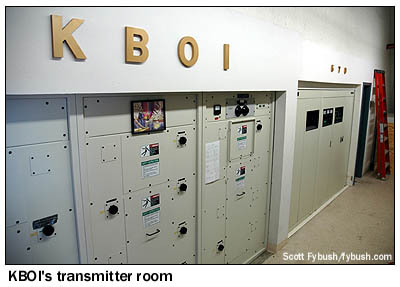 Those are FM bays up on the KBGN tower, a former aux for what's now KBXL (94.1), which now transmits from the Deer Point tower farm that will be the subject of next week's installment. KDJQ was doing Spanish-language programming when we visited; it would go silent a few months later, with the owners listing the station for sale on eBay. At this writing, almost a year later, it's still silent, though a sale to a Catholic broadcaster is pending. 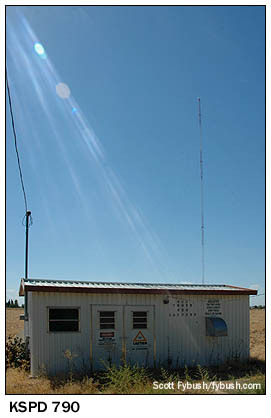 KDJQ does have night power, but not from the Kuna-Mora Road site; instead, its 250-watt night signal reaches Meridian from a site about six miles to the northwest, at the corner of Lake Hazel and Linder Roads. This site is owned by Citadel, and its primary occupant is sports station KTIK (1350 Nampa), which runs 5 kW days and 600 watts at night here. 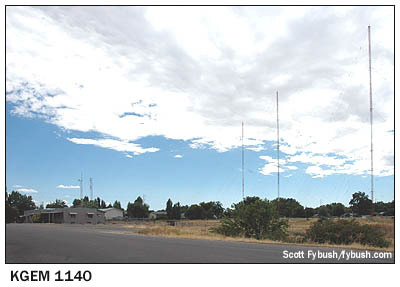 KTIK has been on 1350 only since 2000; before that, it was a graveyarder on 1340, operating from one of the towers here, and before that from a site closer in to Nampa. 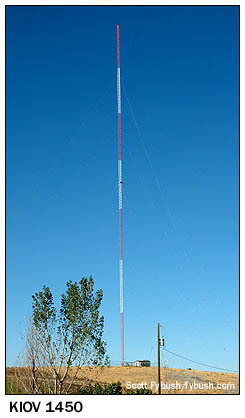 KTIK's site sits within view of another four-tower array, the oldest site in this tower farm. 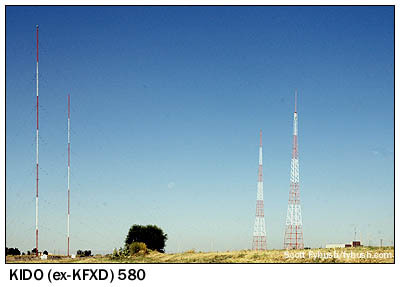 KFXD was running just 250 watts day, 100 watts at night on 1200 when it built a self-supporting tower on Amity Road in 1935. That's the tower seen second from right in the photo below. 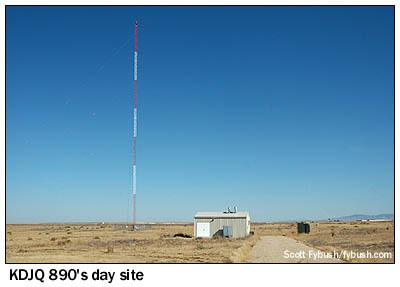 In 1946, KFXD (by then on 1230, thanks to the NARBA frequency shifts of 1941) built a second self-supporter to hold the antenna of the short-lived KFXD-FM, and in 1947 KFXD moved to 580, running 1000 watts from both towers. In 1952, the final two towers were added, and 580 settled down with the facilities it still uses today - 5000 watts, directional at night. 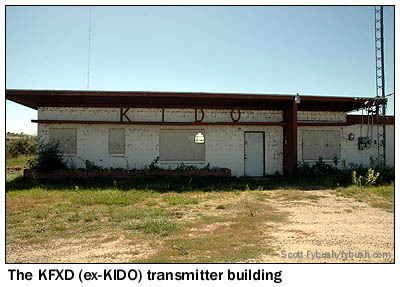 Most of the Boise radio folks we met still call this the "KFXD site," even though in 2002, Clear Channel swapped calls and formats between KFXD and KIDO (630 Boise), moving KIDO's higher-rated news-talk programming to the better 580 signal. It's only a couple of miles, as the crow flies, from the 580 site to the 630 site on Cloverdale Road, more or less at the center of the AM tower farm. 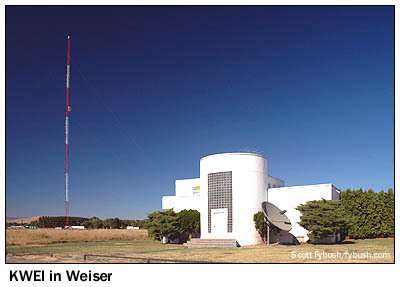 The transmitter building still says "KIDO" on it (it was used for a while as the studio location, too, after KIDO-TV was sold off in 1959 and became KTVB), and the three towers make up one of the most widely-spaced arrays in the country. This is also a 5 kW full-timer, but as a fairly late arrival on 630 (it came to the channel in 1951, after earlier operating on 1350 and 1380), it operates directionally both day and night. At night, in particular, its three-lobed pattern (it protects CHED in Edmonton, the former KOH in Reno and KHOW in Denver) has a deep null over the Nampa area, which includes some of the faster-growing parts of the market. The "new" KIDO on 580, by contrast, blankets that area day and night. Another five miles or so down Cloverdale Road brings us to Boise's most powerful AM signal. 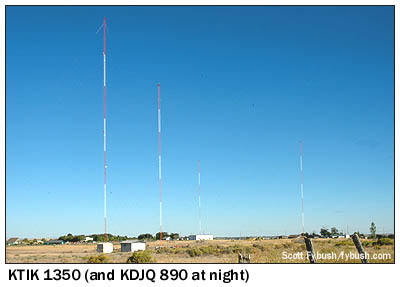 KBOI (670 Boise) booms out with 50,000 watts, day and night, from these six 367-foot towers, and behind them is a fascinating history indeed. In 1947, Dee and Sol Haas put KDSH on the air at 950, broadcasting with 1000 watts from a site on Eagle Road in Meridian, presently occupied by St. Luke's Hospital. 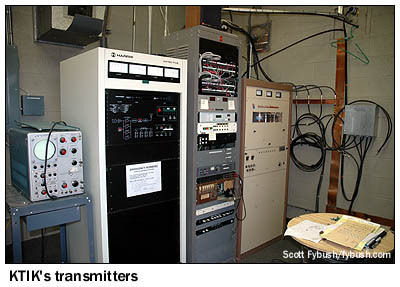 The original transmitter was a Western Electric that was venerable even then, purchased (very) used from KOAC in Corvallis, Oregon. 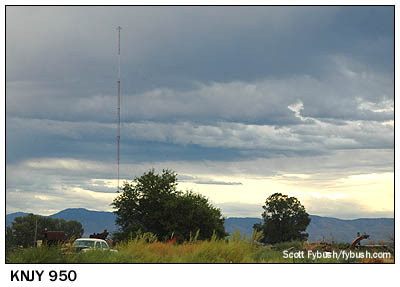 KDSH quickly upgraded to 5000 watts, adding a third tower across Eagle Road, and in 1955 changed calls to KBOI to match its new sister station, KBOI-TV (Channel 2, now KBCI). With the breakdown of the eastern clear channels, KBOI owner Queen City Broadcasting applied to move the station from 950 to 670, and after legal battles with NBC (which didn't want to see the clear channel occupied by its WMAQ, Chicago broken up) and KGEM (which hoped to remain the highest-powered station in town), KBOI was finally granted the move down the dial, which it carried out to much fanfare in the summer of 1968. Inside, the main transmitter is a Harris DX50, but there's some much older iron here, too. 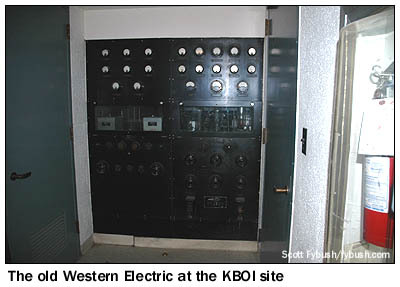 That Western Electric that put KDSH on the air back in 1947, after many years of service at KOAC, was moved down here when this site was built. It's not connected to anything, but it sure does make for a pretty view walking in the front door. 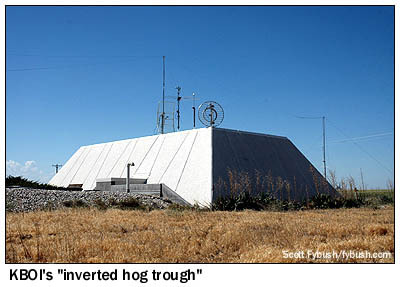 This site was heavily reconstructed in 2000, when Lotus wanted to improve the night signal of another station on 670, KIRN in Simi Valley, California. 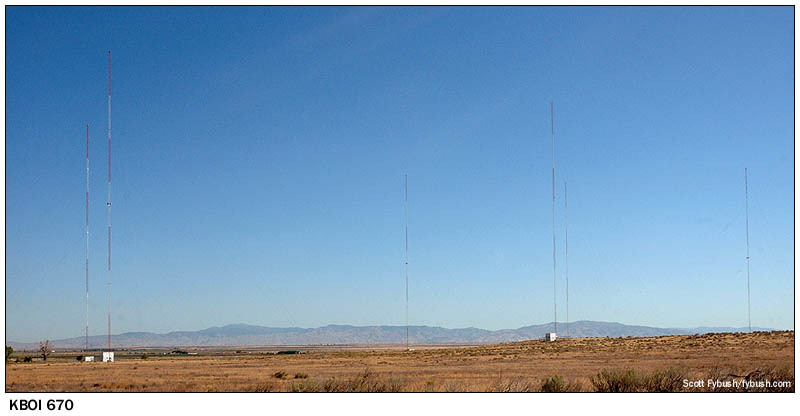 To allow KIRN to move to a new transmitter site in the high desert northeast of Los Angeles, Lotus paid to redesign the KBOI night array, replacing three of its original four towers with five new towers. Instead of blanketing most of the west at night (your editor fondly remembers listening to KBOI's music shows, in AM stereo no less, from along the California/Nevada border in the late eighties), KBOI now has a null toward California, aiming most of its signal north and west. 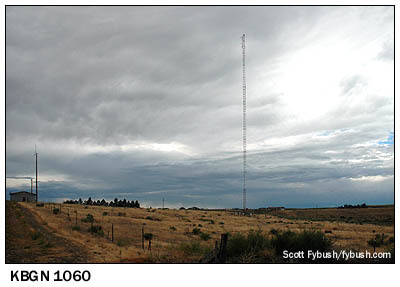 It's still a booming signal into Oregon and Washington, and by far the best AM signal in the market; it's a tribute to the forethought of KBOI's engineers in the sixties that they sited this facility far enough south that all the population growth has remained north of these towers. There's but one other site down here in the tower farm: returning to civilization on Cloverdale, we head north past KIDO - er, KFXD - and spot little KSPD (790 Boise) off to the side on Bott Road. "K-Spud" (we are in Idaho, after all) runs 1000 watts by day, 63 watts at night, and we thought those rays of sun shining into the picture were sort of appropriate, since it's a religious station. 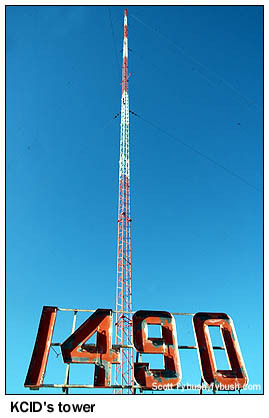 Later, the tower was used by KSRV-FM (96.1), licensed to Ontario, Oregon, as the first step in its move-in to the Boise market. KSRV put those bays on the Payette tower, then left them behind when it moved to Deer Point a few years ago - and we'll see that site, too, next week. We wrap up this installment of our Boise tours with two especially scenic AM sites at the western end of the valley. It's another ten miles or so north from Payette to the small town of Weiser, Idaho (they say it "weezer," like the band), and it's just south of downtown Weiser that US 95 passes the lovely Art Deco building that's home to KWEI (1260). When the station came on the air in 1947 (we're guessing the building is original to that era), KWEI was speaking English; of late, it's become a Spanish-speaking outlet, catering to an increasing number of Hispanics in the area, and with KWEI's 10 kW non-directional day power, it puts a usable signal into Boise, more than 65 miles to the southeast. KWEI also has an FM station, KWEI-FM (99.5 Fruitland), rimshotting Boise from some 30 miles to the north; I'm told the AM programming actually gets to the site in Weiser from its studios in Boise via a subcarrier on the FM signal. Returning to Boise, we make one final AM stop, just east of Caldwell, Idaho, the westernmost major city in the Treasure Valley. From Caldwell, there are two roads back to Boise, 30 miles away - the southern route via I-84 or the northern route via US 20. Heading east from Caldwell on 20, one of the first intersections is KCID Road, and it's there that we find - no surprise here - KCID (1490 Caldwell). 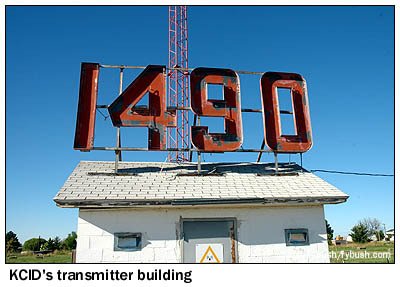 This is part of Journal's cluster, operated from the studios in Boise with a satellite standards format, but it had studios in downtown Caldwell as recently as the early nineties, and back in the days when US 20 was the main road east from Caldwell through to Nampa and Boise, that big red "1490" sign that now crowns the transmitter building (reached by a driveway behind a house on KCID Road) must have been a prominent sight for drivers zipping past. In any event, it's a fitting place to wrap up our tour of the Boise AM landscape, especially since there's nothing higher on the dial, at least for now. That could change someday; the AM application window in 2005 produced a slew of proposals for new AM signals out here, aided immensely by the simple fact that it's a very long way from Boise to just about anywhere, leaving several holes for sizable new stations. There's already one granted CP, for 50 kW days/1 kW nights on 1430 from a site just south of the KTIK towers, and applications all over the place for stations on 540, 990, 1010, 1020, 1100, 1200, 1220, 1230 and 1590. Can Boise support all that radio? We don't know - but we know that when and if these new signals sign on, our friends at the History of Idaho Broadcasting Foundation will be there to chronicle them, and we're grateful to them for a lot of the historical information that went into this installment. 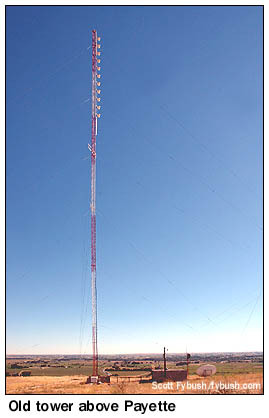 Next Friday, we'll wrap up our Boise visit with a look at the Deer Point FM/TV site high above the city. And in the meantime, stop by Tophour.com next Wednesday to hear the second of three installments of Boise IDs.